This is going to be one of the Mantid archaeology rares in 5.2.
pretty much the same as all the ilvl 463 guns, bows, and crossbows from heroic dungeons, with two notable exception, it's bind to account instead of on pickup, and its minimum level is 85, not 90. this will make it much better for bringing up new hunters than looking to improve your level 90 hunters that already have a heroic weapon. just make sure you upgrade this gun before you send it to your newly level 85 hunters so they can be that much more OP at the cost of some justice points. Just finished making this gun tonight. Sent in screenshots of it. I love the sonic ray waves it sends out. Captain Jack Harkness: Okay, this can function as a sonic blaster, a sonic cannon, and a triple-fold sonic disruptor. Doc, what you got? The Doctor: I've got a sonic, er, never mind. The Doctor: It's sonic, okay, let's leave it at that. Captain Jack Harkness: Disruptor? Cannon? What? The Doctor: It's sonic, totally sonic. I am sonicked *up*! Fun fact: This gun makes no sound when fired, instead it generates a "sonic pulse" visual effect. Star wars, The genonisans anybody? Can anyone answer this question? IF another weapon is mogged to the Sonic Pulse Generator, does it retain the unique sonic pulse attack, or not? Maybe this is a bug, but currently the gun doesn't show on my back (female ne) and only shows when I fire. Hunter weapon! ;-) but for real this time. BoA weapon that only hunters can use? Wondering whose stupid idea it was. I'm super happy the gun is silent, although it seems to shrink on my back. can another class (other character) get this and send to hunter character? If i put a scope on this, will it override its BOA status? SO excited to have a gun that I can use without getting a headache from all the noise. It makes a pleasant wooshing noise when fired, instead of the obnoxious gunshot. Love it. The visuals are pretty nifty as well. Thus far it has not disappeared from my back or mysteriously resized itself. Makes the clicking loading sound without the firing sound, like the silenced rifle. Pretty annoying. Also shrinks to like 50% size on your back. Does anyone know roughly how many common items you have to solve before you can make this? Just a minor opinion thread, sorry if it seems pointless. I just feel this gun deserves more justice than it got. Not the stats, not the looks or firing muzzle flash animation but the SOUND! I think total silence on a gun is kind of ...well...silly. I know its supposed to be some sub-sonic frequency where only mantid can hear it , but still though, give this cool looking gun an awesome sound! On the plus side, if you are someone that always wanted a gun, but hate the firing sound...this is the gun for you lol. I do hope they change this one day and give it a cool sound effect when firing. While Im at it, I think ranged weapons, particularly guns, have a few variants to how they sound when firing. Similar to melee attacks. For example a rogue's sinister strike sounds different from say, their cheap shot. If this is your main weapon and you want your good ol' shooting noise back, just transmog it to a regular gun. Edit: I know most people think this weapon's effects are awesome, I like it too. However some people who have it as their main weapon option may just get bored of the constant clicking noise, and some may not even ever like it. In case anyone was wondering (cause its not one of the best looking gun's), if it gets mogged, the sounds will change to that of the gun you mogging it to look like. In other words it will go back to making gunshot sounds not the silenced clicking noise. If you're trying to upgrade this item to use it on an alt, and come across a scary looking message that says 'upgrading this item will cause it to be soulbound', fear not. Even after upgrading this gun, it is still Battle.net account bound and will not become soulbound to the upgrading character. I was quite excited at first to get this item and went to try out mog but my two main issues is that a gun without a distinctive and satisfying noise isn't quite the same and the size.. it reminds me of early Cataclysm pistol models which sadly just do not fit the 2 hand animations and holstering effect that all Hunters use. However, the muzzle flash effect is a nice new addition to see from the game. Perhaps next we'll see guns with dragon / monster heads opening and closing in time to the shots being fired! I really like the kypari targeting laser on the front. Is this bugged at the moment? It seems like the "sonic pulse" animation that it used to have isn't working anymore. The shots just look normal now. This gun does not sheath on the back the same way as other guns do - while the others sheath "sideways", this one sheathes with its bottom towards the user's back, making the handle curve slightly over the right shoulder. In other words, it sheathes like a crossbow! This is one ugly looking gun, but I want it bad, cause it is the best for a lvl 85 hunter. When I look at the screen shots, it feels like I am looking at a bunch of loonies, who are carrying around a dead ugly looking fish, pretending its a gun, lol. Uses 750 Justice Points to upgrade. This will probably get dislikes but i feel like instead of having the gun shot silent, they could've given it this noise, or even one of these. Would've made for an even more unique gun. But still, this thing is hella awesome for your alts stat-wise (make sure you upgrade it to 1/1!) and aesthetically! Definitely a good incentive to level that archaeology if you got a hunter alt or just want a good transmog. This gun is also a great t-mog for those who love the aesthetic of guns, but use crossbows/bows because of the loud gunshot noises guns make. This is the best of both worlds! This is a list of all Klaxxi-like weapons in game. Weapons listed side by side share the same model. 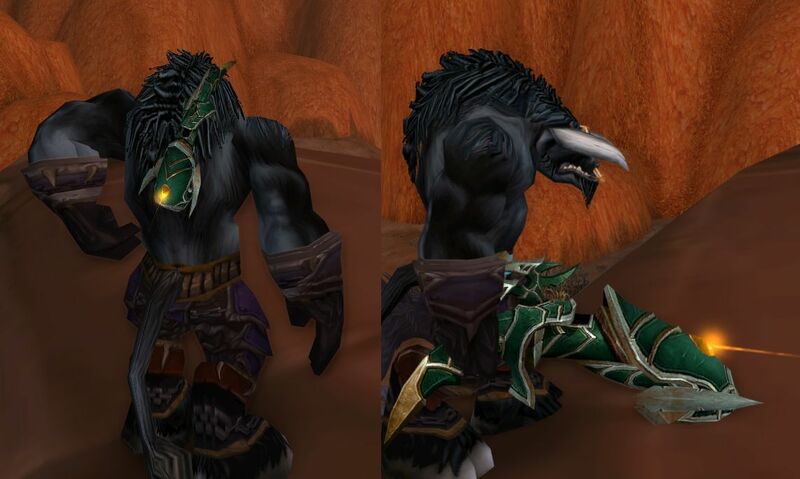 Paragon's Encounter - all Flex / Normal models share the same color. Warforged does not change the color of an item. Amber Sledge of Klaxxi'vess is sold by the Klaxxi, but the model doesn't resemble the one of a Klaxxi weapon nor is it an unique model - Fool's Bane is much more appropriated as suggested by the user Nostranulin . I don't like the way guns in Warcraft sounded. This gun is surprisingly quiet. So that's what my hunter's bow is currently transmorg to. When I first looked up this gun I initially thought it only did the sonic pulse animation when firing auto-shot. However, after I got it in-game I found out that it also shoots a bullet during the sonic pulse animation. Also, it only makes the "clicking" sound when you are using a shot (like ) or beginning auto-shot on a target. All in all it is a good gun for the level and do not forget to upgrade it! Otherwise I'll just stick to my Core Marksman Rifle SUPERSOAKER! Mantids with this gun can be a reference to Star Wars race called geonosians, as they use a very similar "sonic weapon", and looks pretty like the mantids. Also, form of the gun and it's "waves" reminded me ASMD from old good forgotten game - Unreal. Now that justice points are gone, how do you upgrade it?